A fitch is a polecat, found commonly in Eurasia, Africa and Europe, according to the Encyclopedia Britannica. The albino, domestic version of the polecat is known as a ferret. 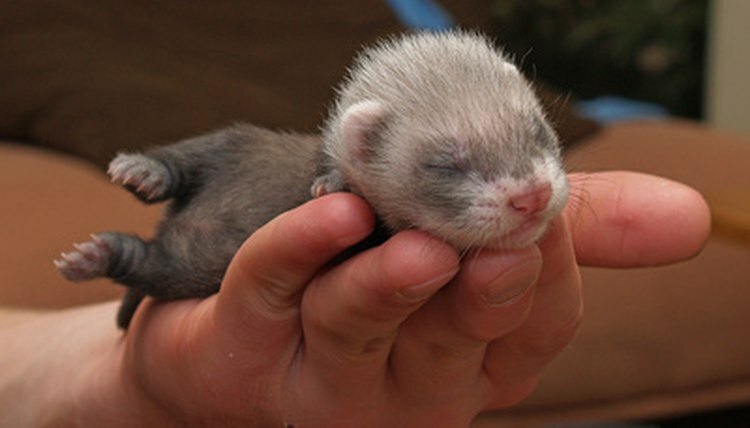 The term "fitch," usually used in the fur trade, refers to a polecat, a weasel-like carnivore and mustelid. The mustelidae family includes weasels and minks, among others. The fitch or polecat is also called a foul marten for its smell. The common polecat has long, coarse brown and black fur, with yellow spots on the face, according to the Encyclopedia Britannica. It has a long bushy tail, its torso ranges from 14 to 21 inches long and it usually weighs from one to three pounds. The fitch is found in the wooded areas and steppes of Eurasia and North Africa. The fitch hunts its prey at night. Since it does not usually climb trees like other mustelids, its main diet consists of birds and small mammals it can catch on the ground. It also feeds on eggs, lizards, snakes, frogs and fish. Fitches, which usually produce litters of three to eight babies, are born in the spring. The gestation period is two months. According to Furs.com, fitch fur is similar to mink but with more distinctive markings. Most of the pelts, also referred to as fitches, originate in Scandinavia or Russia. A coat made from fitch sells for between $4,000 and $7,000.